Autumn in southern Utah is a perfect time to ride! It's only about two hours (or maybe even a little less) from Las Vegas, and you get to see the amazing Virgin River Gorge on your way up and back. We'll meet just off I-15 Exit 8 in the heart of St. George, and we don't waste any time getting right into the climbing. We begin with a climb of about 350 feet in the first two miles up Red Hills Parkway, and you'll immediately see some of the breathtaking scenery that makes this such a wonderful place to ride. Next, we'll head up Snow Canyon Parkway through Ivins and into the desert community of Kayenta with its smooth, almost-empty roads that attract cyclists from all around. We'll ride out to the Shivwits Band of Paiute Indians reservation for our rest stop, and then we'll head back through Ivins and into Santa Clara on a glorious new bike lane that was recently added. 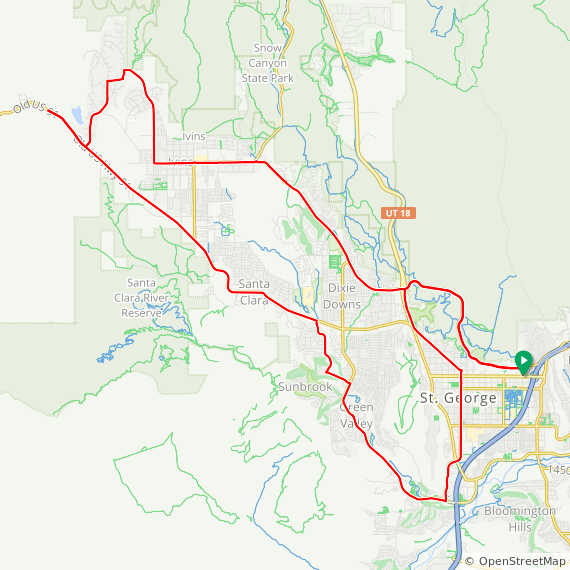 We'll head back into St. George and slowly climb through the historic downtown district on our way to our final climb, back up Red Hills Parkway in the other direction and then back down to our meeting point. Ride With GPS reports about 2,000 feet of climbing for this ride. Food, water, and toilets are available inside Maverik. Park and meet in the rear parking lot behind the gas station, near Denny's. Look for the ALC banner! Nevada riders, note: St. George is on Mountain Time, one hour ahead of Las Vegas. Please RSVP so I can plan appropriately.